It is worth doing – and do so in the company of a tourist as it makes for some interesting questions and conversations. The NCA (National Capital Authority) is the agency largely responsible for the look of this nationally significant landscape. I must point out that the problems with this site are the cumulative result of decades of what seems to have been ad hoc decisions. I wish the present NCA the best of luck in resolving these. 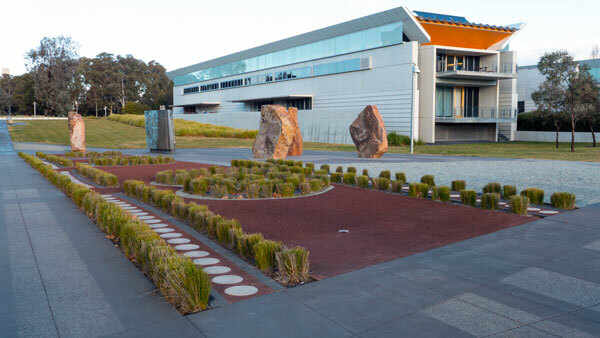 Firstly we stopped in front of Commonwealth Place and I tried to explain what this design was all about – but the site itself failed to impress. The wall to the right has had hessian covers hanging off it for a year or two and the display cases now are empty except for dirt and moss. The artworks along the internal walls have faded badly and are hard to decipher. The space to the east previously the NGA’s contemporary gallery among several other things, sits there vacant. Hmm, Commonwealth Place failed to impress my visitor. 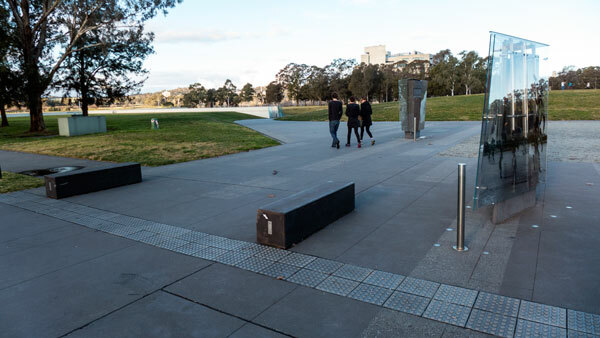 The foreshore pathways and promenade areas are looking good – and always in use. The views across the lake on a winters day are wonderful. Then I needed to explain that the mound behind was there to commemorate reconciliation – and those information shard thingys scattered about are somehow apart of this. The little garden plot and the large rocks near the Portrait Gallery attracted some positive feedback – they are a curious mix of things. We called into the Portrait Gallery to see the exhibition Demspey’s People – which I highly recommend. Plus it was a cold day and we used any excuse to duck inside for a few minutes. As we walked up to Old Parliament House (Museum of Democracy) we were confronted with the now large village of tents and other structures that have come to represent the “Tent Embassy’. Their presence was not easy to explain. While I was very clear about the original purpose of the embassy and that the original message was as relevant today as it was back in 1972, we did have trouble with what we were observing. 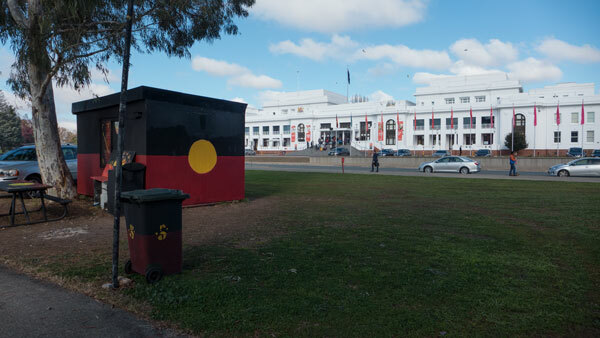 The original Tent Embassy was established a protest in front of the then Parliament House. The trouble being the Parliament moved up the hill in 1988. Therefore the presence of this protest camp is now completely out of sight and out of the minds of the current federal politicians. It is now more like a tourist attraction. As we talked we witnessed a group, who had been standing around the central fire (keeping warm I hope), broke off and walked with a couple of flags around the Old Parliament building and headed to the Parliament House up the hill. I was questioned about the size of the camp – it is now quite large. The best I could offer was that it was a site that attracted people from all over Australia and it seemed to serve multiple political and accommodation purposes. The container that was part of the original looked a little lonely. We also observed a couple of tourists wander down. They stood around looking over the whole encampment, I don’t think they understood what they were looking at, they read a sign or two, pointed at a few of the constructions, and then wandered off again. There was no-one around, or at least visible, to talk to them. My friend suggested that maybe it was time to build something more permanent as an on-going information site to the many unresolved issues around the recognition of our first peoples (she is Canadian and used that term). I agreed – but hesitated to suggest what that could be. Maybe the NCA should be working with the local indigenous peoples to look into this. We meandered into the Old Parliament House as I wished to show her that wonderful small exhibition of screenprints (a medium I trained in) – onetoeight – The first Prime Ministers. Definitely worth the visit – and congrats to Alison Alder – the artist. As we wandered through The Old Parliament House Gardens, I explained how these were meant to be used in their time; the problem being that they were upgraded to their present standard well after the Parliament and the politicians had moved up the hill. So yes, they are heritage (sort of), but the reality is that they were not in this complete form when the politicians were in this building. A curious twist to the history of these gardens. At this point we could have called by the Pork Barrel café on the side of the former Lobby Restaurant – and being such a cold day – we were looking for warmth. Sadly both these were closed. I am sure the NCA could explain this vacancy – I couldn’t. We wandered on and walked around the National Science Centre and took in the artworks on the northern side. It is an eclectic mix. The site is an interesting place to welcome visitors or to have a picnic. Which was happening right then and there. The site contains one of the better meeting places – being a very large pergola shelter with generous seating and a sheltered barbecue – which on the day was being used by a group of musicians. Lastly we walked onto the National Library. The Poplars in front of the NLA are in a very sad state. I had heard that they were to be replaced – soon. I would have thought the NCA should not have allowed them to get so bad before having them replaced. And finally we were warm again – stopping for a final break at the Bookplate café in the National Library. It was revamped recently – and is a recommended place to meet friends (best on the weekend – parking is then free). While in the NLA, we took in the very beautifully curated exhibition – melodrama in meiji japan. Full marks to the NLA – this is one hell of an exhibition. There’s a lot of good bits around the Parliamentary Triangle – but also some stuff that needs to get sorted and mistakes fixed (Commonwealth Place) by the NCA. 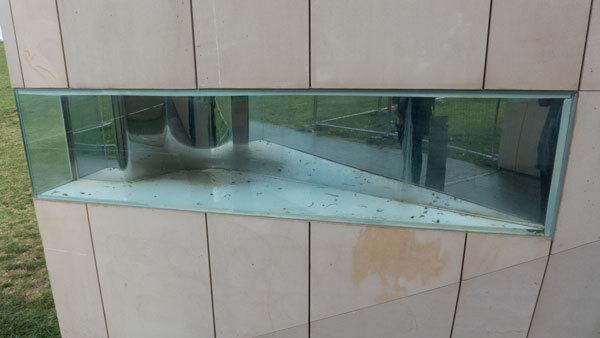 The bits and pieces that form the Reconciliation Place walk (Portrait Gallery to the National Library) need to be overhauled. 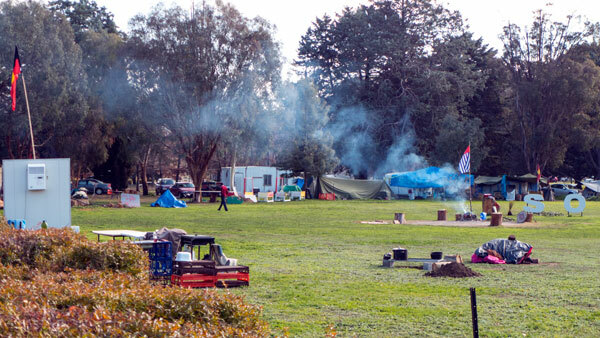 As for the Tent Embassy – it is an interesting and curious village – but is it still serving its original purpose? There must be something that could be more effective. I am sure the NCA has views on that. 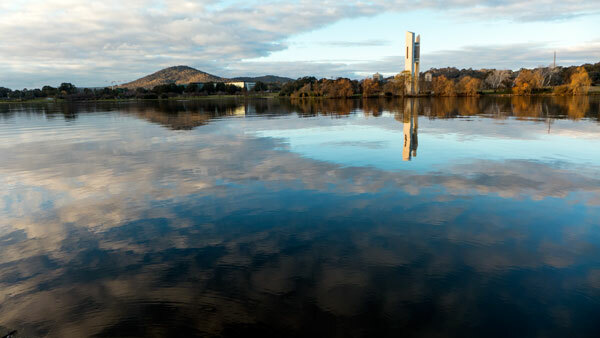 Have you been to the Parliamentary Triangle lately? Have you any thoughts on its future? PS: We went to the NGA the next day to see the many great exhibitions there – but that’s another story to be told elsewhere.